The Frederick County Office of Economic Development (OED) website provides a one-stop source of online information about the rich agricultural contributions. 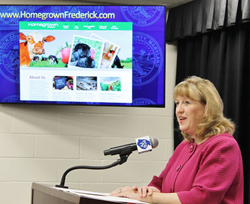 County Executive Jan Gardner today recognized a new agricultural website, http://www.HomegrownFrederick.com, designed by the Frederick County Office of Economic Development to support the county’s rich agricultural heritage and bright business future. HomegrownFrederick.com serves farmers and citizens by promoting local agriculture and business, and provides a revamped look for county agriculture marketing programs. The website includes a listing of creameries, Christmas tree farms, horse farms, farmers’ markets, CSAs, events on the farm, Family Festival at the Farm details and restaurants that feature locally grown foods. The previous Virtual Farmers Market website was redesigned to feature 75 farms with an interactive map so visitors can search for farms by the products they sell. A section on Frederick County’s rapidly growing craft beverages industry is displayed and users can search for wineries, breweries and distilleries. With the “farm-to-glass” movement on the rise nationally and locally, OED has used mapping technology for Frederick County’s craft beverages industry to help make visiting these locations easier. For more information, contact the Office of Economic Development at 301-600-1058 or visit http://www.HomegrownFrederick.com. OED also has an updated website with beautiful photography and resources to help businesses start, grow or move to Frederick County. Visit http://www.DiscoverFrederickMD.com to learn more.